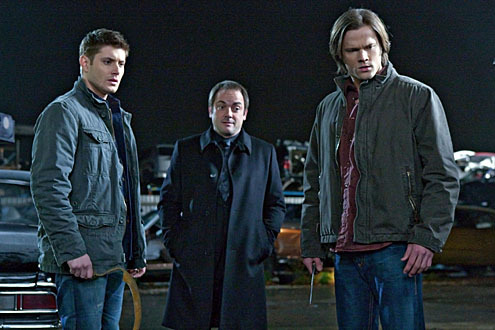 Chances are if Mark Sheppard makes an appearance on your favorite genre television show, you’re in for a treat. Over the past few years, the versatile actor lists among his credits memorable appearances on Doctor Who, Leverage, Supernatural, Firefly, Chuck, Warehouse 13, CSI, White Collar, Dollhouse, The Middleman, Burn Notice, 24, and The Bionic Woman. Last night, he made an uncredited appearance in his recurring role of Interpol investigator Jim Sterling on the summer season finale of Leverage. Mark took some time out of his busy schedule to discuss his latest appearance as Sterling, spoilers and geekdom in general. “Between Nate and Sterling, each can see the other being a close second.” Your latest appearance on Leverage is a bit of a departure for Sterling in the sense that he needs Nate. Did this change your approach to the character? Not at all. I don’t think that it’s that much of a departure…I think there’s a situation in which he needs Nate, he’s just not being so forthcoming about it. (Laughs) Obviously, he has a time crunch issue and he has to go to somebody that he can trust to execute almost the impossible within the time frame that’s required, and who else would he got to? Where else would he go to? It’s very interesting to see…remember that the opposite of love is not hate…it’s apathy. You can’t say that it’s an easy position. We don’t hate each other, or if we do hate each other then it’s not that far removed from the fact that at some point we cared for each other. I mean, what the writers have done with our characters, with mine and Tim’s characters over the last 4 seasons is instead of having us develop our relationship, there’s actually been little pieces as we go forwards, little pieces explaining how we got to where we are and I think that’s just a fascinating way to go. It’s a very subtle difference, but it makes a massive difference. Sterling know who Sterling is and Nate know who Nate is and Sterling knows who Nate is and Nate knows who Sterling is. I mean, it’s that simple. I think it’s that simple…that they intersect, their paths are going to intersect given their circumstance and they’re always going to intersect. It’s just how they deal with each other on any given day. Do you think the next time we see Sterling, his dynamic with the group will have changed? I think it changes every time because he’s not changing who he is and they’re not changing who they are and every time we meet…I mean, the ongoing relationship with Elliot Spencer is always going to be an issue. What’s going to happen the next time any of them meet? It’s so hard to explain. Is it going to be different? Yeah, it’s going to be different but it’s always the same…the way they intersect…who else would Sterling go to? I mean, when you have a situation that’s that important in that time frame, who else would he trust? And it is trust. I don’t think that they’re that far apart. I think the other would could concede that the other would come in a close second, but there’s a mutual respect. Like? I don’t think they really like each other, but I do know that they respect each other and that at some point they definitely cared about each other. It’s fascinating to me. 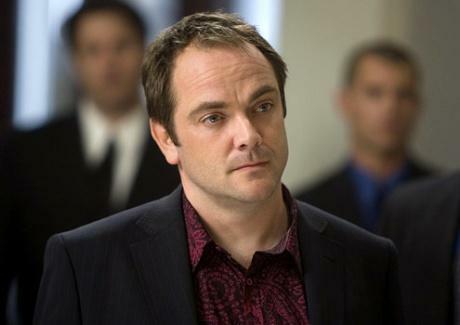 You are an icon of genre television these days, having appearances in virtually any cool show that exists…there’s a Mark Sheppard appearance. Do you approach a recurring role differently than a guest spot? I owe the fans a lot because it’s the fans response that drives a lot of that, you know? Here’s a “What If” scenario – if you could appear on any show currently in production that you’ve never guest starred on, what would it be? You’re gonna hate this answer but I’m gonna give you the answer in this very strange way…I was in Chicago doing shoot for Supernatural and a fan asked me the same question and I’m sitting there and I’m considering it and I’m like, “Well, Torchwood would be fun in a strange way but Doctor Who would be fantastic” and everybody screamed. That was the deal, then in my pocket I had the ticket to get to Cardiff the next day. Just remember that…I have to keep the secrets, it’s my job. I look forward to the journey ahead because you could also say that none of these shows were these shows when they first started, right? 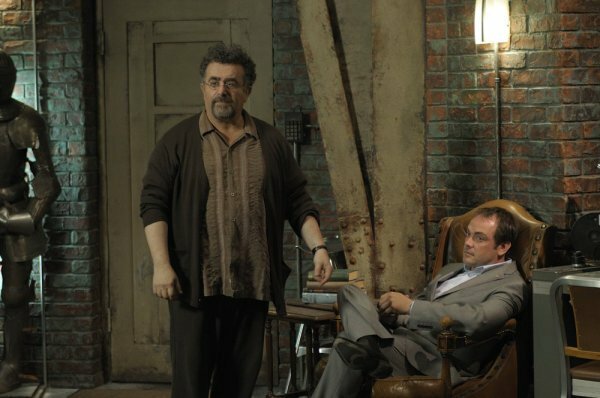 And I’ve been lucky enough to be involved in these shows…Leverage wasn’t Leverage until it became Leverage, you know? I was involved pretty early on…it’s a lovely thing…Supernatural really reinvented itself many times. The great job was Warehouse 13. Your work is a testament to your love for not only the work but also for the fans and keeping it pure for them…spoiler-free and everything else…it’s actually very noble and fantastic. I’m a fan..it’s not that noble. I’m a fan. It’s not noble at all. Who the hell wants to be spoiled? I was on Battlestar Galactica, for God’s sake…we shot the final episode, we keep it a secret for nearly eight months. The reason we kept it a secret for nearly eight months is nobody really wanted to know. That’s the truth. I had this debate on Twitter at one point where I’m saying…somebody goes “That’s a spoiler” and I’m like “You know there’s a cutoff point for spoilers”…there’s a cutoff point. You know, a week, two weeks after something’s aired, go track it down and watch it. Stay off the internet. You want to wait for the DVDs? Stay off the internet. What can you tell me about Mysterious Island? It’s hard…there are so many things going on right now. I listen to a lot of music. I have an eleven year old and a six year old, both boys, and they both play soccer and they both have different and interesting musical tastes and different television tastes, too. The six year old has discovered Matt Smith as his Doctor, so everything that Matt does is fascinating to him and he’s just…to watch a six year old watch Doctor Who is just fabulous, to watch it through his eyes, to watch such an interesting era…the fact that I just happen to be on it doesn’t hurt. (LAUGHS) So there’s been a lot of Who-vian activity in my house recently which is just fabulous. 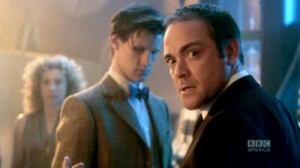 I’ve got Daleks everywhere and Weeping Angels and all sorts of creepy stuff all over my house…that’s fun. There’s people from the Doctor Who show in my house, meeting my kids and they’re freaking out. That’s just a blast. You know, we were at Comic-Con, of course, this year, while it was a little more difficult than any other year, I owe this huge thank you to the fans…I was still able to walk the floor, you know? With both my boys and my wife, we were able to walk around without getting over involved or anybody making it difficult…just a lot of love and a lot of fun. I got to meet Neil Gaiman up in San Francisco, what an amazing, amazing time that was, the two of us walking down the street, walking down Geary Street, singing obscure Ian Dury songs to each other, which was just fantastic, just before The Doctor’s Wife episode aired which was just a beautiful episode and just getting to talk with him and pick his brains about what’s going on, and his appreciation of Crowley and the connections in Good Omens…I know my stuff, I read my stuff, yeah. Chris Hardwick, what a great guy to meet, from the Nerdist, which you probably know. But being at Comic-Con with Javier (Grillo-Marxuach) and all the rest of my friends and all of the great writers that have looked after me and a lot of the actors that are so much fun, got to see my old friends from Adam Baldwin to Zachary Levi, to talking to Chris Fedak about Chuck, I mean, how much fun is it, talking to David Greenwalt about his new show (Grimm). My god, have you seen the trailer for it? Looks fantastic. With the Little Red Riding Hood section? No, no, the inside was filled with boxes so he couldn’t get in, it was very funny. But that’s the positives of it, geeking out on everything. There’s comic book stuff. I mean I get to go work with Ben Edlund who created The Tick…how much geekier can that be? How much more fun can you have when your favorite writers are writing comic books, your favorite writers are writing television shows, your favorite writers, you know, doing everything and getting to be part of that? It’s just nice. We’ve grown up in one of the most fascinating times in geekdom, really. You know, it’s been said a hundred times, again, but the geeks have inherited the Earth, it’s the way it goes. You know, what’s happened is all of the thirty-five year olds that couldn’t get jobs at seventeen, they were writing comic books in their bedroom and now they make hit TV series. It’s amazing, amazing. And you can’t cheat them, you really can’t them. You can’t lie to them, you can’t manufacture this stuff. You can’t tell them what they’re going to enjoy. How do you…there’s no way to judge what the fans are going to love. Either they do or they don’t, right? And I believe the common denominator of all of this stuff, as fans, we’ve latched onto, the common denominator is how much heart, how much love how much passion, how much love has been put into it because you can smell it. When it’s cynical, we don’t care. We’re not interested. Agree? Mark Sheppard’s latest appearance on Leverage can be seen HERE and he’ll likely be turning up on your favorite show when you least expect it. This was a great episode. This episode and the previous two eps have been some of the best eps yet. Loved the previous ep when they stopped the old man from getting the heart transplant. Loved seeing Nate like that. And this ep was great as well, especially when you see why Sterling used the team. Great stuff.